Many believe that millennials will continue to be renters and not homeowners for various reasons. The first of the millennials were not even in a position to consider buying until roughly 2008.
Credit has become tighter for older buyers; therefore, the recent rise in first-time buyers actually can be attributed to millennials. There has been a lot of buzz in the news recently suggesting that millennials will forever be renters and not homeowners. Reasons for this theory are plentiful and include amenities that apartments offer, flexibility when it comes to moving and changing jobs, and inability to afford a home given the crushing student debt load that many are carrying. So will this be the renter generation? Let’s take a look at the data. Those who believe in the “perma-renter” theory point to U.S. Census Bureau statistics that state the homeownership rate for individuals under the age of 35 has dropped from a peak of 43.6 percent in 2004 to 34.6 percent today. Now, I can’t deny that this is a precipitous drop, but let’s not get carried away quite yet. To start with, the first of the millennials (born in 1982) were not even in a position to consider buying until roughly 2008. That accounts for four years of college followed by two years of work. We all know that 2008 was a terrible year to buy a home, so let’s bring it forward a little further to 2012. At that time, the ownership rate was roughly 36.7 percent. Since then, it has dropped to the current level of 34.6 percent. This drop is hardly a drastic one, but it is a drop all the same — so what happened? As mentioned earlier, some suggest that millennials are bypassing homeownership because they prefer to remain mobile and are drawn to the bells and whistles that modern apartment living offers. I would add to this that urban life simply appeals more to younger people than living in the suburbs; especially to those who are just starting their careers and don’t yet have a family. But the options to buy in many cities are few and far between. Since the Great Recession, there has been a shortage of new, for-sale multifamily development, which limits the availability of urban housing for buyers. At the same time, new apartment projects are being built at a frenetic pace. According to REIS, 240,000 apartment units are scheduled to open their doors by the end of this year, which represents a 43 percent increase compared with 2014, and well over 100,000 units above the 10-year trailing annual average. Now let’s turn to the National Association of Realtors’ data on the percentage of existing sales to first-time homebuyers. 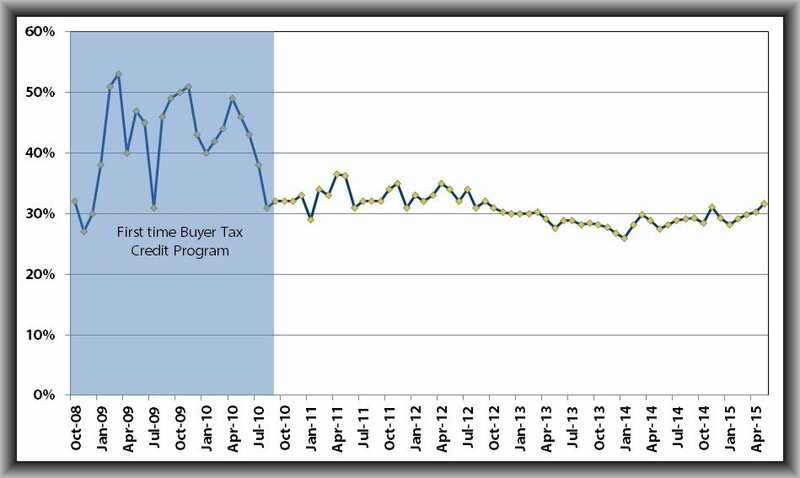 As the chart below shows, between 2008 and mid-2010, there was a rapid runup as a result of the first-time homebuyer tax credit. After that program expired, the percentage naturally dropped and trended lower through the end of 2013. However, it’s clear that the share of sales to first-time buyers has been trending higher for the past 17 months. But not all of these buyers are millennials, so we need to dig a little deeper for answers. To better understand the makeup of first-time buyers, I started by looking at their age distribution. There is some great data from the Federal Reserve Bank of Atlanta that sheds light on this through analysis of mortgage data and demographic attributes. 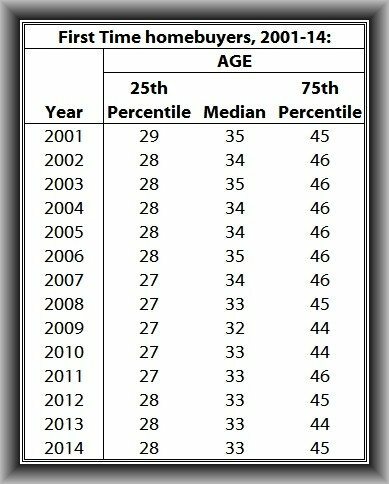 As is shown in the table below, first-time buyers are actually not getting older. Although their numbers tumble after the crash of the housing market, the age distribution did not change drastically. Now, if we believe that the decline was driven by the millennials, surely we would have seen first-time buyers getting older, but interestingly enough, they didn’t. To add to this, analysis prepared by the Center for Real Estate Analytics suggests that the gap between median credit scores of younger buyers and older buyers has closed. In other words, credit has become tighter for older buyers; therefore, the recent rise in first-time buyers actually can be attributed to millennials. So, if credit quality isn’t the issue holding back millennials, and rents continue to increase at a frenetic pace, it stands to reason that we will see more and more members of this generation becoming homeowners. I hope I’ve demonstrated that these broad statements that people are making about millennials being perma-renters are unfounded. These broad statements people are making about millennials being perma-renters are unfounded. Are many of them delaying their purchasing decisions? It appears so, but I expect them to move into homeownership in greater numbers as they start to marry, have families or simply find themselves paying too much in rent. So where are these millennials going to buy? I’ll tackle that topic in an upcoming post. Matthew Gardner is the chief economist for Windermere Real Estate. He is the former principal of Gardner Economics and has over 25 years of professional experience both in the U.S. and U.K. Follow him on Twitter @windermere.